Ikhlas and Anjum's story is similar to that of numerous couples who are unable to lead a happy marital life due to regressive Khap panchayats that have made a mockery of the constitutional rights of citizens, in the name of upholding culture. The sole difference in this case is that the couple is Muslim and is lucky to be alive. Otherwise countless lovebirds and young couples are facing terror tactics of the Khap Panchayats, which declare marriage within the 'gotra' as wrong and punishable. Young couples have been mercilessly killed to uphold the custom. 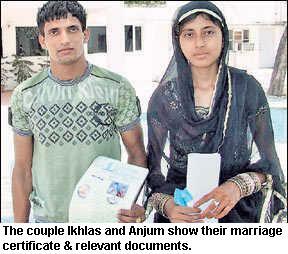 Ikhlas, 22, a policeman with Indian Reserve Battallion in Haryana, married Anjum, who belongs to Rajasthan. The couple was told that the wedlock was illegal and the marriage should be dissolved, as their respective families belonged to the same 'Badakia gotra' clan nearly 125 years ago. So what if they are not closely related, the Panchayat claims that the girl's family had migrated from the boy's village nearly 100 years ago. As per Khap diktats, there can't be marriage among families in a village as girls and boys hailing from a village are considered 'siblings' as per the local custom. So no person can marry in his or her village. The families of Ikhlas and Anjum have been socially boycotted. Ikhlas says that he will approach the High Court and seek justice. The couple says that the district administration doesn't appear supportive either, which is a common complaint. Other couples in similar situations also rue that they got no support. The couple is scared of their safety as many cases of killings have occurred after refusal to bow to the diktats of the khap panchayats. This Panchayat that oversees 360 villages wields considerable influence in this part of Haryana. 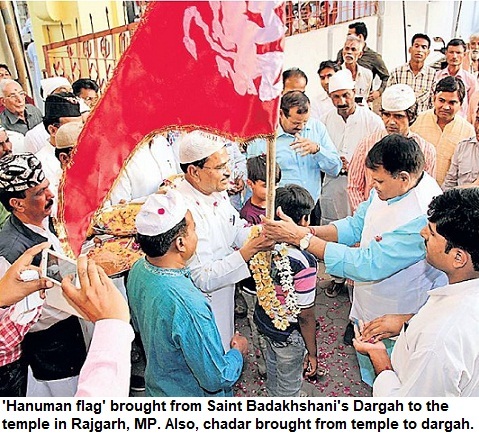 The head, Ramzan Chaudhary, said that though the panchayat members are Muslim, the culture was equally important for them apart from their religion. The region where panchayats hold sway is spread over Haryana, Western UP and part of Rajasthan. Due to the influence they wield on villagers, the politicians keep the khap leaders in good humour. Even wanton killings, terrorising newly wed couples and harassment of Dalits [read poor] is tolerated or ignored and the administration often turns a Nelson's eye. 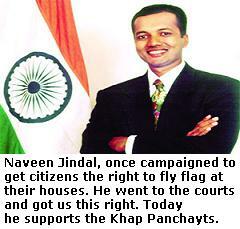 Sadly, Congress leader Navin Jindal had even succumbed to the pressure of Khaps recently. This is more disturbing that he belongs to the young generation and had once launched the campaign to get citizens the right to unfurl the national flag. But the Khaps which not only prevent such marriages and term them illegal, get support from leaders like Om Prakash Chautala and BS Hooda as well. Despite repeated incidents of youths killing such couples in the name of 'culture' and honour, the killings are not condemned by Khaps, that are responsible for creating this lawlessness in a region close to the national capital. Doesn't it expose our leaders who refuse to take strong stands in the times of 'bytes' when mere progressive utterances, let alone action, is lapped up and helps in building image of a politician even if he hasn't done anything on the ground level. But they fail to even speak up. Isn't it a tragedy of our times! The Horse's Grave in India: GhoRay ki Mazaar, Guess Where? Have you heard about this grave? The mazaar of the horse is not too well-known but once in a while one does hear about it from somewhere. Though such graves are not common but I have seen the graves of elephants and heard about mazaars of parrots and cats in the past. Still, this one is slightly different. Here the grave has the horse-shape structure [termed ghoDaa or ghoRaa] built in the midst of the mazaar. At many places where Sufi saints passed way, the local residents also built the mazaar of their pet animals when they later died. But they are plane platforms with no image. This one is clearly an idol and may raise the heckles of those who fume at the sight of even the dargaahs and mazaars of genuine saints, let alone a mere animal! When even the normals mazaars are being considered symbols of idolatry by a growing number of Muslims, what will remain of a poor horse. Interestingly, the mazaar is painted green and has a Muslim-ness around it, unlike the Hindu samadhi. A local resident tells me that this particular horse was a buzurg [perhaps he meant saintly]. Another person said that it was a saint's horse which died here and was laid to rest but couldn't tell anything about the saint. May be I need to do more research. Whatever. Someone does the upkeep and the flags that aflutter don't appear too old. Must be someone cleans the premises also on a regular basis. These are all examples of the unique cultural and religious fusion of Hinduism, Islam and local faith, and almost in every city you find something that represents neither of the religion or has ingredient of both of them. Investigation and Media's role in Terrorism: Indore, Hindutva hardliners' haven! The arrest of right-wing militants in connection with the blast in Ajmer Dargah isn't surprising and is just another in the series of arrests of members of organisations ranging from Abhinav Bharat to Sanatan Sanstha who have committed a series of bombings in India from Malegaon to Goa. Headlines in prominent newspapers and leading English channels read like 'Abhinav Bharat man caught', 'Ajmer blast suspects linked to Hindu groups' or 'Ajmer blast: Hindu group responsible'. Bettig mafia respsosible for blast in Bagalore stadium during IPL! During the Indian Premier League (IPL), bombs exploded in the stadium in Bangalore. Soon after, journalists who crave for breakthroughs and first page bylines, were mouthing names of persons involved in the blasts. There were reports that security agencies don't deny the role of particular persons. The classic case was in Assam where major bomb strikes in which dozens died were ignored when ULFA was involved but once minor blasts occurred and a news agency suspected 'Islamists' angle', it was suddenly prime time news and got repeatedly termed as terrorist attacks. Just a day ago the Bangladesh government has handed DR Nabla alias Ranjan Daimary, the chief of the militant NDFB, that was involved in serial bombings in Assam in 2008 that caused over a 100 deaths. But the arrest didn't make big news despite the fact that a terrorist mastermind was caught. Ironically media perceptions force police and investigative agencies to hurry up in investigations and they throw up names to evade intrusive journos by saying that such group's involvement is not ruled out. The casualty is truth. Apart from inefficiency and political reasons, often the cases are not cracked because of these reasons. It's a fact that had there been a BJP government in Maharashtra, Goa or Rajasthan, the activists of Sanatan Sanstha or Abhinav Bharat may never have been arrested. Though Himanshu Panse's role in blasts in Marathwada had alerted security agencies, the investigation was closed. Firstly, some officers were soft on the group while others apparently didn't want to get into controversy. It took an officer of the calibre of Hemant Karkare to unravel this network. Sadly, this doesn't happen. When some youths from Azamgarh were arrested, the entire district was demonised. When youths from a particular Muslims-dominated town were arrested, the name of the town 'Bhatkal' was added to their names though it was not their surname. The aim was to defame the town. It was part of a strategy. Shouldn't Indore be also termed haven of Hindutva-wadis in India. This peaceful town in Central India has been linked to almost all the major cases of bomb blasts. Should towns be defamed: Is Indore Hindutva-wadi's Azamgarh? It is not that MP police were not aware of Sunil Joshi's shadowy organisation that was based in Indore. It was also aware of Samir Kulkarni's Abhinav Bharat that was functioning from MP. But the state police didn't act then even though local Hindi papers printed tonnes of material. Kulkarni's role in planting bombs at Bhopal's major Islamic gathering of tablighi jamaat that attracts 1 million Muslims was also known but police under BJP rule didn't act. It is only when CBI and central investigative agencies reached Indore that the activity began. The unfortunate aspect is that everything in India either gets politicised or communalised. Read the entire series on Falsehoods about Terrorism on this Blog.